This innovative Pellamar hydrating anti-wrinkle cream works to reduce early signs of skin aging with its gentle formula. Mineral salts and amino acids in the Pell Amar extract, with jojoba oil, vitamin E, enriched with hyaluronic acid and soluble collagen, make a rejuvenating wrinkle prevention cream. 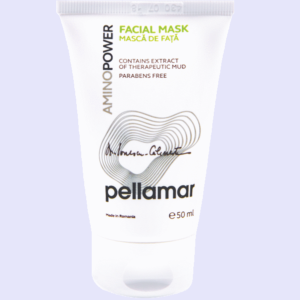 PELL AMAR EXTRACT – natural source of energy for the skin – rich content of mineral salts playing a role in restoring intracellular potassium ion concentration and extracellular calcium ions, with long-lasting effect on skin replenishment. Three active ingredients naturally present in the epidermis structure plus a cofactor – jojoba oil. Cofactor – JOJOBA OIL – oil with stimulating properties of moisture, containing esters, fatty acids and fatty alcohols which provide an optimal hydrophilic-lipophilic balance, causing a perfect balance between the nourishing and emollient properties of the product. An innovative principle of prevention and mitigation of wrinkles plus a cofactor – Tocopheryl Acetate (Vitamin E). Cofactor – TOCOPHERYL ACETATE (Vitamin E) –acts as a protective role against harmful effects to the body, it contributes to braking degradation and aging processes of the epidermis. Apply in the morning and / or in the evening after cleansing and toning the skin, a small amount of cream on the face and the neck, then massage gently until it absorbs into the skin. AQUA, GLYCERYL STEARATE PEG 100-STEARATE, CAPRYLIC / CAPRIC TRIGLYCERIDE, CETEARYL ALCOHOL, GLYCEROL, COLLAGENE, HYALURONIC ACID, ELASTIN, MINERAL SALTS AND AMINO ACIDS FROM PELLOID MUD EXTRACT (PELL AMAR), DIPEPTIDE DIAMINOBUTYROYL BENZYLAMIDE DIACETATE, JOJOBA OIL, TOCOFERYL ACETATE, EDTA, ETHYLHEXYLGLYCERINE / PHENOXYETHANOL. Exceptional …….. PellAmar Hydrating Anti Wrinkle Cream melts and gets into your skin, leaving it firmer, younger and healthier. Although I did not have wrinkles on the face I used it and I did not feel to “load” my skin. It hydrates very well. Applied in the morning, after washing and cleansing the skin, until the evening the skin retains its elasticity, there is no feeling of “tight face”. It is very well absorbed by the skin and gives it brightness.